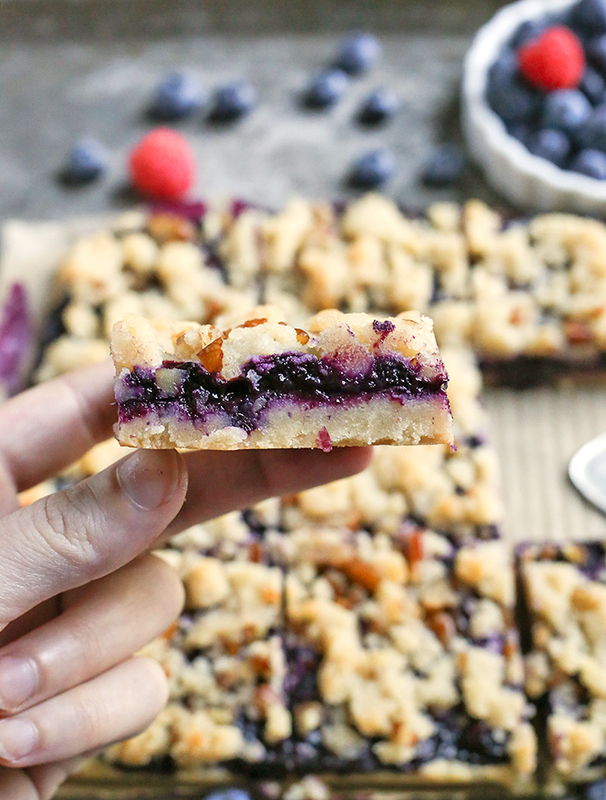 These Paleo Blueberry Pie Crumb Bars are simple to make and so delicious. 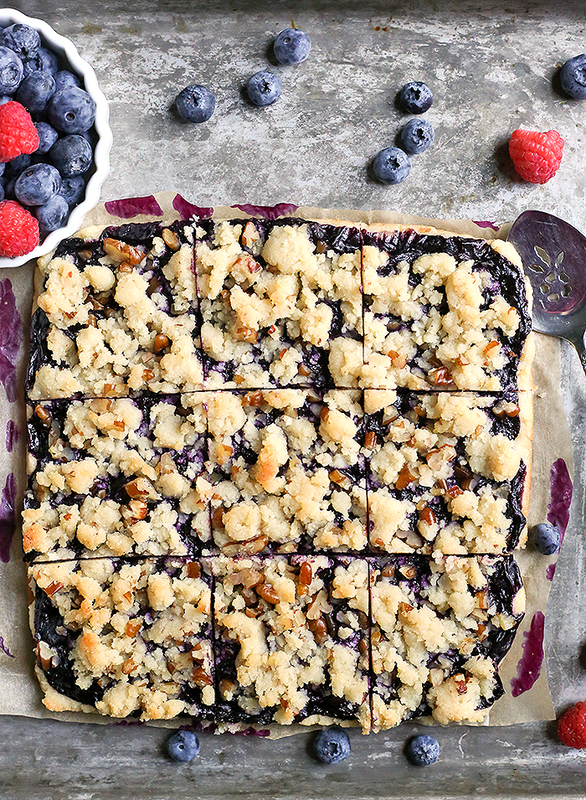 A shortbread crust, thick layer of blueberries, and a crumble topping. 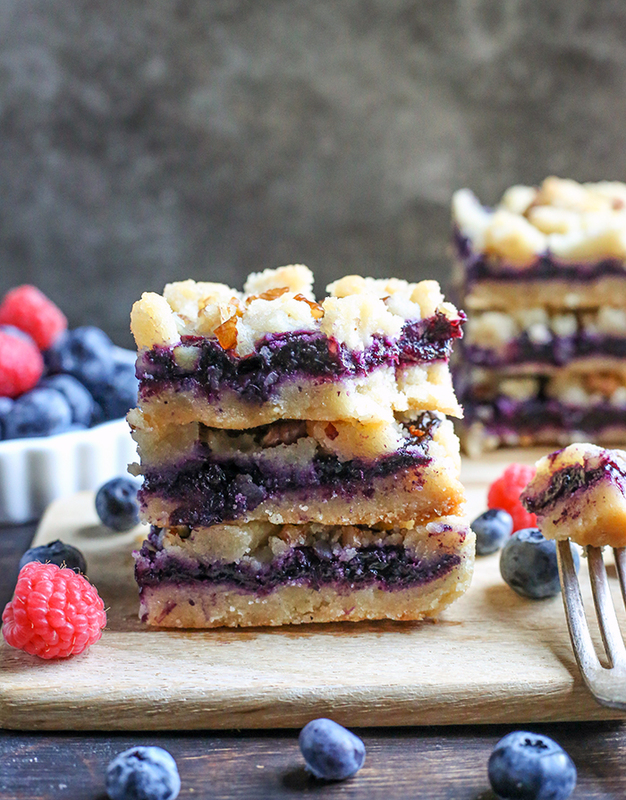 These layered bars are gluten free, dairy free, vegan, and naturally sweetened. I am obviously trying to pack in all the summer recipes while I can. I posted these Paleo Blueberry Baked Fritter Bites last week, this Paleo Lemon Zucchini Coffee Cake that is a must-make, and this Paleo Double Chocolate Zucchini Bread that is nut free and so delicious. My brain is switching gears to fall so this may be my last summer post. 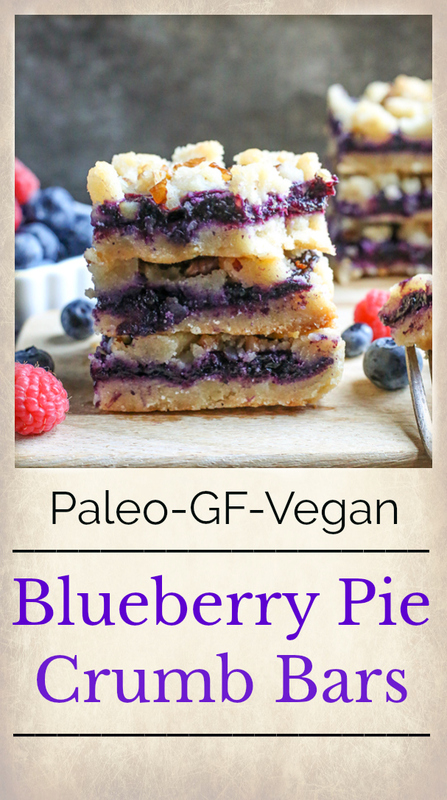 This recipe is based off my Paleo Raspberry Crumb Bars that are super popular. And I made a fall version, Paleo Apple Pie Crumb Bars. This shortbread recipe is my tried and true go-to that is melt in your mouth good and sweetened just right. The fresh blueberries are cooked down into a fresh, thick sauce. Almost like a jam, but not as jiggly or sweet. That is spread on a simple shortbread crust, topped with more shortbread that makes a crumble topping and baked until golden brown and delicious! These do need to be kept in the fridge after the first day or they get pretty soft. It’s not a bad thing though. 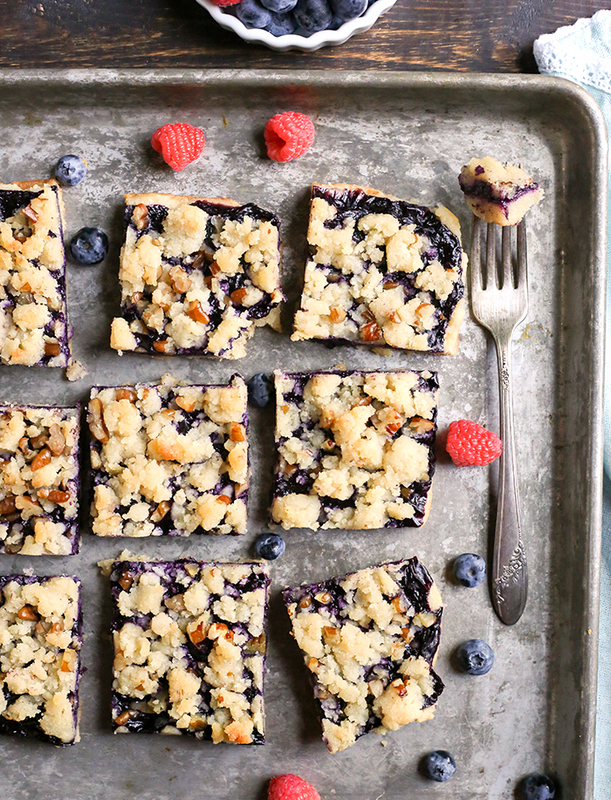 Cold blueberry bars. Yum! 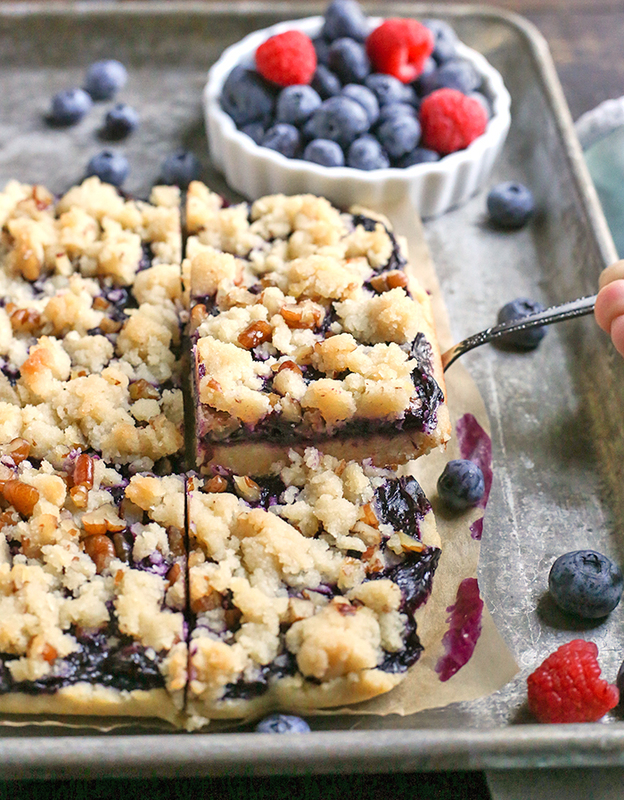 These Paleo Blueberry Pie Crumb Bars are the perfect way to use up those summer berries. 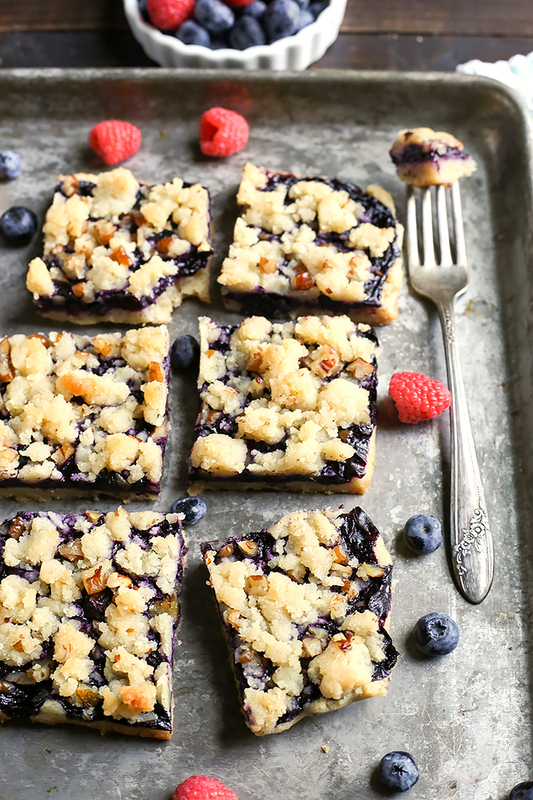 The soft shortbread, freshness from the blueberries and crumb topping will make you love them so much! Here are my other crumb bars you may like: Paleo Raspberry Crumb Bars and Paleo Apple Pie Crumb Bars. In a medium bowl, combine almond flour, coconut flour, salt, vanilla, maple syrup, and coconut oi. Stir together until it is well mixed and everything is incorporated evenly. Press 3/4 of the mixture (the other 1/4 will be used for the topping) into the bottom of the pan and bake for 10-12 minutes, until golden brown around the edges. While the base is cooking, make the filling. In a sauce pan combine the blueberries, maple syrup, tapioca flour, and salt. Cook over medium heat, pressing the blueberries to break down. Cook for 7-9 minutes, until the mixture is thick and no large blueberries remain. Scrap mixture into a small bowl and refrigerate until needed. Once the base is cooked let cool 5 minutes. While that is cooling add chopped pecans to the remaining dough. Spread the blueberry sauce on the base then sprinkle the dough/pecan mixture evenly on top as evenly as possible. Press down gently to make sure it stays in place. Bake for 20 minutes, or until golden brown. Made these tonight, and they were delicious! Thank you so much for this wonderful recipe. What’s the best way to store them? You’re welcome! Thanks for trying them. Covered in the fridge is best. Hi Cindy- yes, that will work. Enjoy! I made these this morning with my nephew who is learning to make healthier dessert options. We LOVED them! Thank you for a great recipe! You’re welcome, Erica! Thanks for trying them and I’m so glad you like them! Made these yesterday, and they were amazing! Trying to resist eating the whole pan at once. I sprinklee little bit of cinnamon and maple sugar on top before i put them in the oven. Thanks for trying them, Ali! I’m so glad you like them! That topping sounds so good!